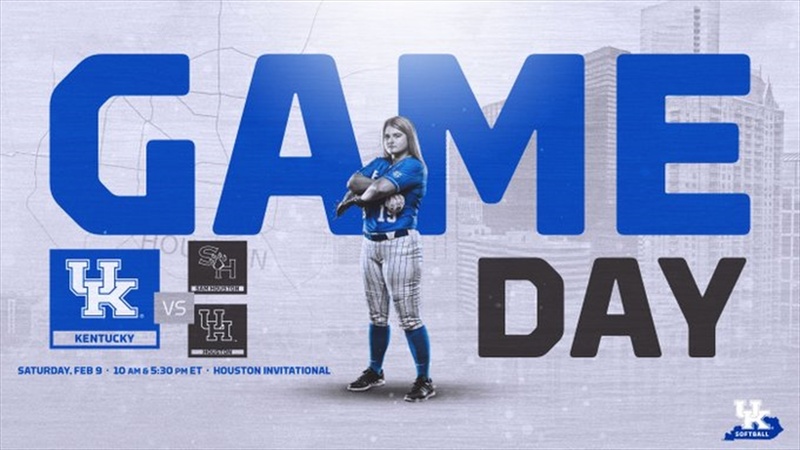 The University of Kentucky softball team continued their season in the 2019 Houston Invitational against the Sam Houston State University and the University of Houston. Kentucky defeated Sam Houston State 6-0 thanks to Meghan Schorman’s two-hit shutout with nine strikeouts and one walk. The Cats also defeated Houston, 13-1, bouncing back from their loss to the Cougars on Friday evening. Schorman starts the game out with a groundout to Reed at short. Sam Houston State get two hits, but two big strikeouts by Schorman ended the inning for the Cats. Katie Reed got Kentucky started in the bottom of the first. The Wildcats put two in scoring position, but a strikeout ended the inning. It was a 1-2-3 second inning for Schorman in the circle- with her third and fourth strikeouts of the game. Nothing for the UK offense in the second as the Wildcats sent in order. Schorman retired seven in a row with another 1-2-3 inning. Alex Marten plates the first two runs of the game with two-RBI double to LF and after three, the Wildcats lead. Schorman continued her dominance and retired 10 in a row, as the Bearkats were sent down in order again. The Wildcats got going at the plate and the base paths, as a steal creates a pair of throwing errors, and Bailey Vick and Kayla Kowalik score to make it 4-0. Katie Reed added an RBI single as well and the Cats extended their lead. Schorman continued to roll with her seventh and eighth strikeouts of the game. She ran her streak to 13 Bearkats batters in a row who did not reach base. Katie Reed provided a diving catch along third base line diving to her right which ran the streak to 15 batters in a row. A Kayla Kowalik triple down the left-field line to start UK sixth, and Katie Reed brings her home with an RBI double to the wall in left. Meghan Schorman in her first NCAA start throws a two-hit shutout with nine strikeouts and one walk. Katie Reed climbs in from the right side to start the game. A Home Run by Alex Martens gave Kentucky a 2-0 lead. Nothing across for the Cougars in the bottom of the first. The Wildcats add on a third run thanks to a Kowalik double to score Kelsee Henson from third. Baalman gets her second K of the game to cap off the second inning. A Home Run by Kelsee Henson, a two run shot, is clobbered over the CF fence and Kentucky extended the lead to 6-0. This was her second-career HR, and first since her freshman season. LJ singles through the right side to score Kowalik, and Kentucky lead 7-0. Kelsee Henson knocked a double, scoring two more runs, and the Wildcats have now sent nine to the plate this inning and lead 11-0. After a nine pitch at bat, Maclai Branson doubles down to LF line to score Henson. Houston finally scored on a UK error. Alex Martens roped her second two run double to the gap in LF to score Babbs and Kowalik and extended UK’s lead over Houston 13-1. They play Oklahoma State Sunday at 10 a.m. ET to close the 2019 Houston Invitational.